I just read a startling article about how in Canada and Ontario in particular the UV rays will be extra strong this year. WHY? Well, the ozone layer that had been on the mend seems to have the largest hole ever lingering over Canada, but mainly Ontario. Now I've always been careful with my skins exposure to the sun, but this news shows that now, more than ever skin protection is important all year round. Loading up on SPF is your best defence when enjoying nice hot sunny days. For the last year I've been using two Neutragena products with 100+ spf but unfortunately the company doesn't offer it here in Canada (but they do have 30, 45 and 60spf which are more than antiquate). I also love Coverfx Briteprepfx with 50 spf. Give Yourself Time. Apply a sunscreen with a spf of 30 or higher 15 minutes before going outside. 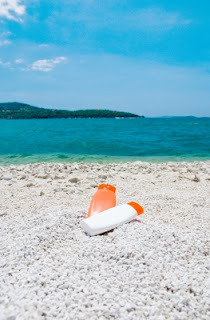 If using sunblock (physical protection like a mineral product) you don't have to wait. Use Enough Product. It is said a shot glass is needed for the body and a teaspoon for the face. When in doubt add more or go with a stronger spf just to be safe. Reapply. Reapply it after swimming or doing anything active. When in doubt put more one, just be safe. I prefer sprays for my body so I fill a travel bottle so I can reapply during the day. Wear Sunglasses. Wear them. You can get melanoma on your eyeballs!!! Not worth scotching your eyes when going out. Try to wear them whenever possible. Wear a Hat. Protect your scalp, very important for men too. Be Aware, Be Prepared. Check the UV index for the day. Should you bring something to cover up with if you are out for a long time? Will there be shade where you are going? These are my tips, I hope they help. Last year I was out at a ball game and then to the bar, in direct sunlight from 1:00 until the sun set...no burn why because I was prepared.